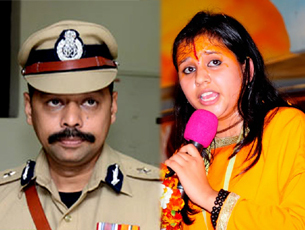 Mangaluru, March 2, 2015: City Police Commissioner S Murugan has said that the Police Department was contemplating to file a case against Sadhvi Balika Saraswati who he said has delivered a provocative speech during the Hindu Samajotsava held at the Nehru Maidan in the city on March 1, Sunday. The Commissioner said the police was thinking of initiating action in this regard and added that the Department has taken serious cognizance of the fact that the programme continued even after 5.30 pm despite clear orders to end the programme by 5.30 pm. Most shops and business establishments in the city remained closed since March 1, Sunday afternoon, while police themselves had asked the shopkeepers in some areas to shut down in the afternoon in order to avert any untoward incident. Nonetheless roadside stall owners who sell pani puri, ice cream and other eatables made good business. If earlier Samajotsavs in the city were aired live on some local TV channels, this time it was not the case.